1. Team IOU (Kerry Awful & Nick Iggy)- The NWA Southern Tag Team Champions get their record tying 3rd #1 in the Tag Team Top 5 as a boy and his dog were absolutely unstoppable over the weekend. They defeated Xion & Stanley TWICE at NWA SAW on 4/11. They then went to IWA Mid-South on 4/13 where they won a Gauntlet Match vs. The Hooligans, Alex Castle & Frank Wyatt, and The Submission Squad, eliminating every single team from the match. There really was no debate among the official voters this week. It was a clean sweep among them. #2 in the online poll with 143 votes. 2. Men of the Year (Michael Elgin & Ethan Page)-The AAW Tag Team Champions and former 2 time #1’s in the Tag Team Top 5 defeated Rich Swann & Lince Dorado on 4/11 to retain the titles. They are now 5-0 as a team in AAW. Who would have thought they would be in the Top 5 so many times when 2014 began? It’s been a pleasant surprise to see them do their thing this year. 3. Global Green Gangsters (Kellie Skater & Tomoka Nakagawa)-Talk about a team that didn’t get as much respect as they probably deserve! The SHIMMER Tag Team Champions defeated Leon & Ray on 4/12 to retain the titles, then defeated Rhia O’Reilly & Saraya Knight on 4/13 and Cheerleader Melissa & Mercedes Martinez as well to go 3-0 on the weekend. They have won 12 straight matches as a team. You would think that would be enough to get them a #1 or even a #2, but strong competition held them back. #4 in the online poll. 4. BULLET CLUB (Karl Anderson & Doc Gallows)-The IWGP Tag Team Champions fell slightly this week as over the weekend they teamed with Bad Luck Fale and Tama Tonga and were defeated by Captain Taiwan (Captain New Japan), Hirooki Goto, Manabu Nakanishi, & Yuji Nagata on 4/12 but bounced back and retained the IWGP Tag Team Titles vs Captain Taiwan & Hirooki Goto on 4/13.They have won 9 of their last 12 matches and are 14-8 in 2014 as a team (4-1 as a 2 man team). #5 in the online poll. 5. The Viking War Party (Alexandre Rudolph & Jake Parnell)-The NEW SNPW Tag Team Champions make their first appearance in the Tag Team Top 5 after defeating former #1 The Hooligans on 4/12 to win the titles and followed that up with a win in a 3 Way at IWA Mid-South on 4/13 vs. Joseph Schwartz & Chase Matthews/Josh Crowe & Marcus Edwards to go 2-0 on the weekend. Look out for them to pop up more as 2014 rolls along. #3 in the online poll. 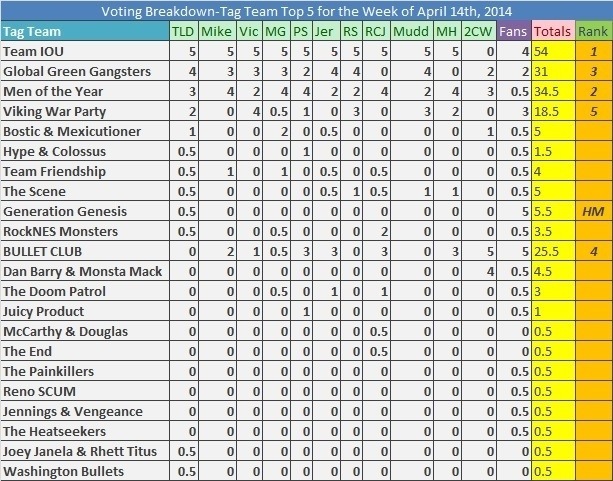 ← Who should be #1 in the Tag Team Top 5 for the Week of 4/14/14?